Today, Columbia Records/Legacy Recordings released Bruce Springsteen: The Album Collection Vol. 1 1973-1984, a boxed set comprised of remastered editions of the first seven albums recorded and released by Bruce Springsteen for Columbia Records between 1973 and 1984. All of the albums are newly remastered (five for the first time ever on CD) and all seven are making their remastered debut on vinyl. 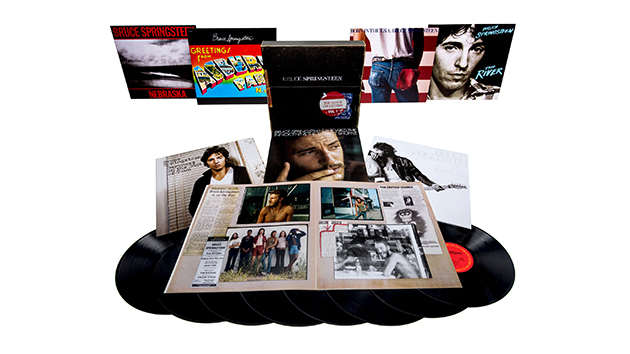 The seven albums are recreations of their original packaging and the set is accompanied by a 60-page book featuring rarely-seen photos, memorabilia and original press clippings from Springsteen's first decade as a recording artist. Acclaimed engineer Bob Ludwig, working with Springsteen and longtime engineer Toby Scott, has remastered these albums, all newly transferred from the original analogue masters using the Plangent Process playback system. ‘Bruce Springsteen: The Album Collection Vol. 1 1973-1984’ is available now on CD at Amazon, LP at the Bruce Springsteen Music Store, and digitally at iTunes.